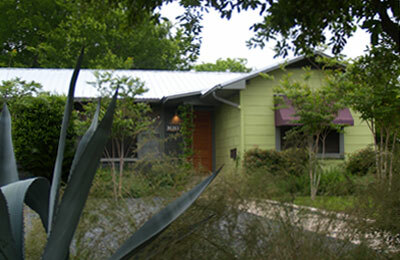 A major renovation of an existing structure and a reworking of the exterior landscape made a new house out of this existing duplex. 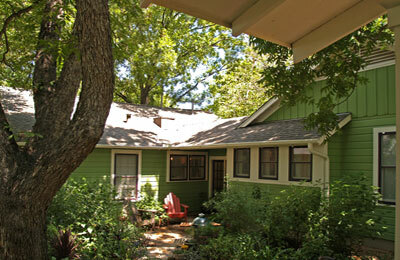 A new front porch and back deck provide a feeling of separate ownership for each unit. 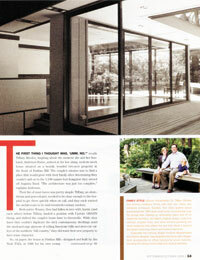 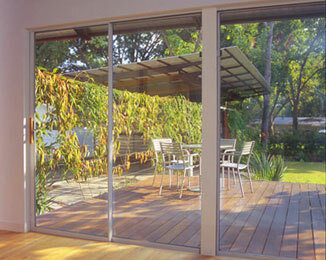 The interior was opened up by the addition of a hidden beam and sliding glass doors to the rear deck. 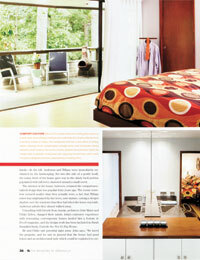 Interior space was organized by the addition of an 18 foot long cabinet held below ceiling height, which is usable from both the living and private sides of the space. 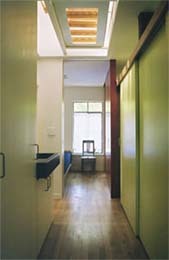 A skylight brings light into the middle of the unit and opens up the hall. 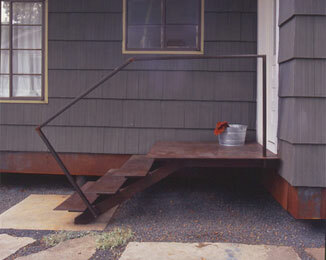 A modified pull down ladder hangs in the skylight and provides access to storage and mechanical equipment in the attic. 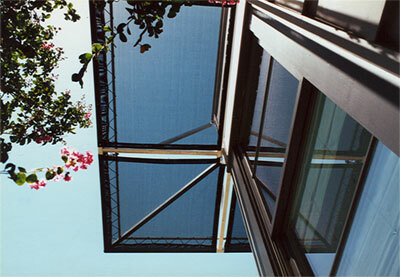 A new metal double roof shades the existing roof. 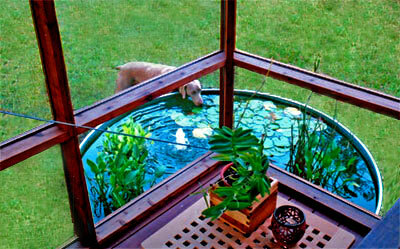 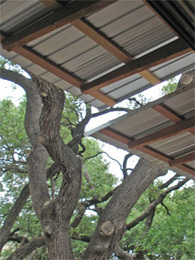 Its steel rafters provide a protective four foot overhang. 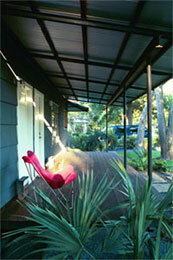 A new carport and open air shop also provide privacy to one side of the yard. 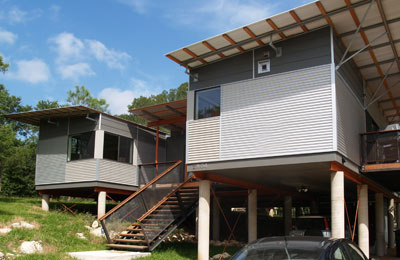 This home was featured in Dwell, the Austin AIA Homes tour, the Austin American Statesman, the Fine living Channel, HGTV, and Sarah Susanka's book "Outside the Not So Big House", New York Times, as well as in "Contemporary Detail" by Yenna Chen. 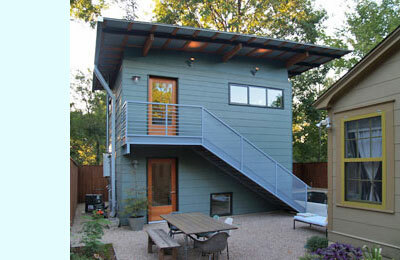 This 3-story structure is for a young family of four in the popular Bouldin Creek neighborhood. 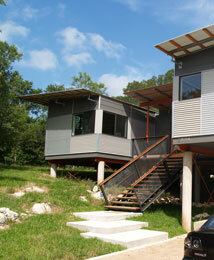 A weekend get-a-way near Lake Travis for a hip Houstonite. 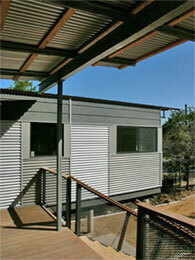 Sustainable strategies include a SIPS roof system and Thermasteel framing, as well as a rainwater harvesting system. 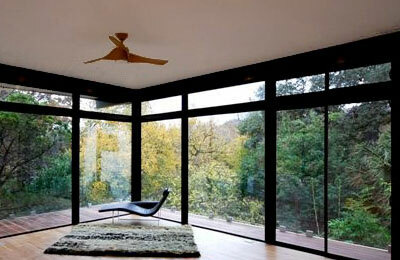 The house is sited to form a courtyard with the hill on one side and to soar above the view on the other. 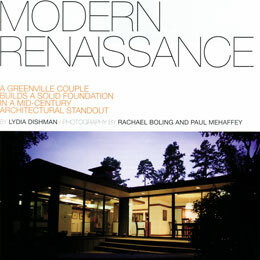 Done in collaboration with Ted Young. 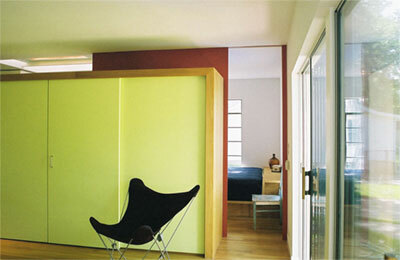 This is an addition and renovation of a 1940's experimental house constructed of clay tile walls and concrete ceilings. 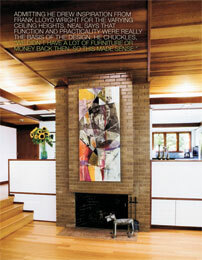 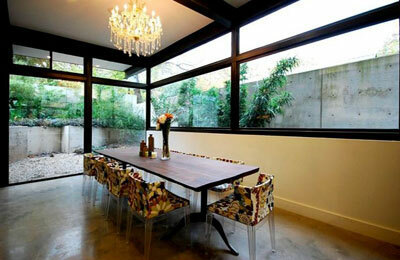 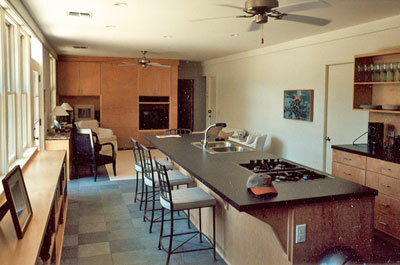 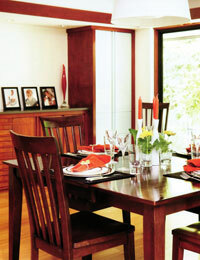 The existing house was reorganized to create a larger living/kitchen area. 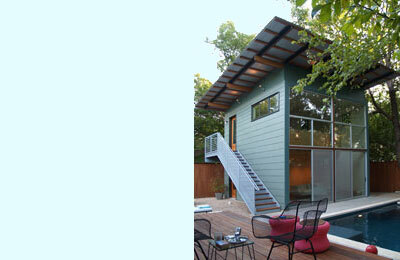 A home office clad with stucco integrates the addition with the existing house. 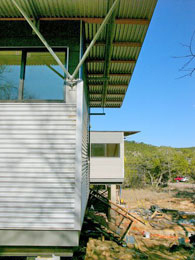 On the exterior, the stucco continues past the office to become the base for the master bedroom/master bath suite, where the client requested a more conventional construction system and higher ceilings. 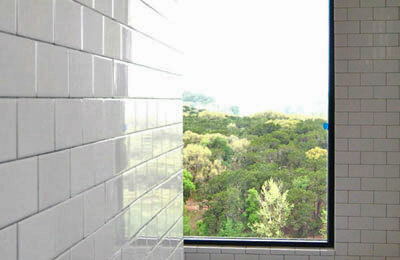 Light was brought into the master bath while maintaining privacy by popping up a row of clerestory windows shaded by a roof which hovers above the rest of the addition. 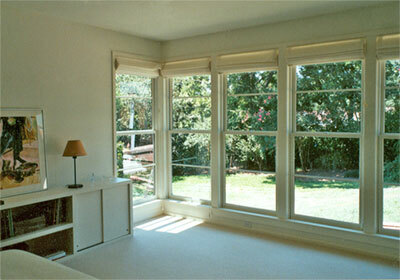 Large double hung windows open all areas of the renovation to the rear yard. 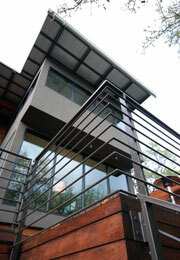 Designed in collaboration with R. Burton Baldridge. 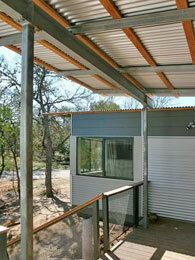 Built in collaboration with Branson Fustes and R. Burton Baldridge. 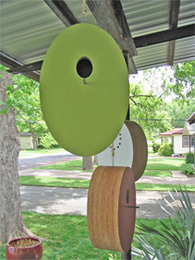 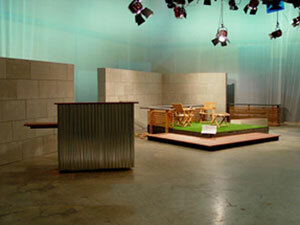 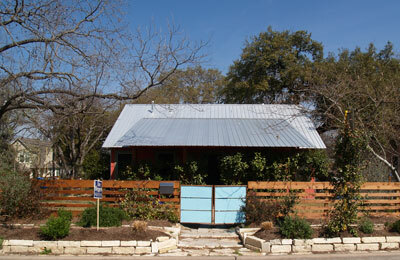 Designed and built to replace the aging set of the popular public television show the Central Texas Gardener. 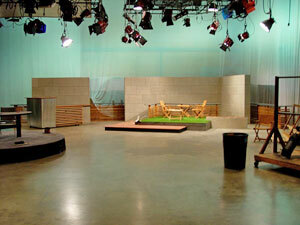 Two different areas were required to satisfy the way in which this show was filmed. 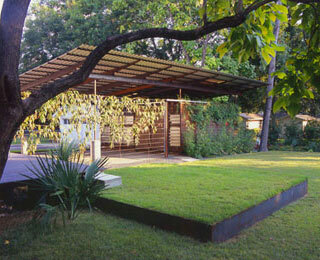 The interview area is a steel landscape box filled with grass. 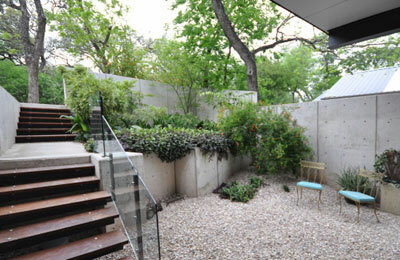 A wood inlaid stone landscape box/wood platform/and steel topped cedar fence provide places to display plants in this area. 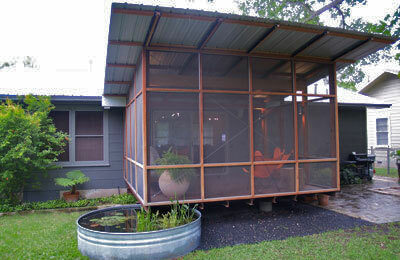 A metal wrapped cabinet with a wood top serves as the demonstration area. 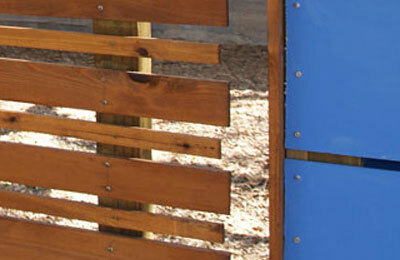 These two areas are integrated by two stone backdrops and another fence element which wraps the back of the entire set. 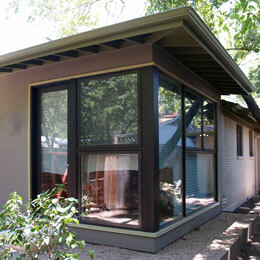 This extensive addition and renovation provides more usable living space as well as a new master suite on the rear of the house. 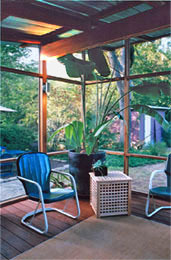 A connection to outdoor space is achieved through a new screen porch and sand set paver terraces. 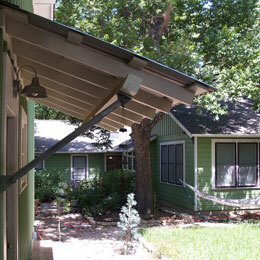 In addition, some of the spirit of the rear addition is brought to the front by replacing an existing dysfunctional front porch. 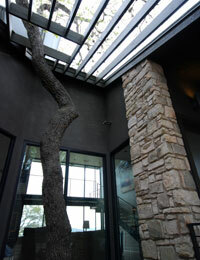 Six foot deep douglas fir overhangs shade the new living room expansion and master suite addition. 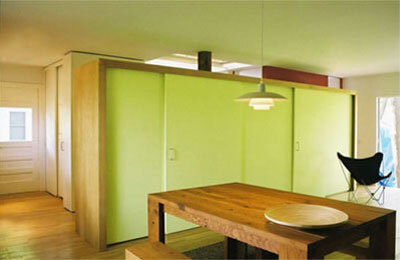 Built in cabinets throughout provide storage and a sense of scale. 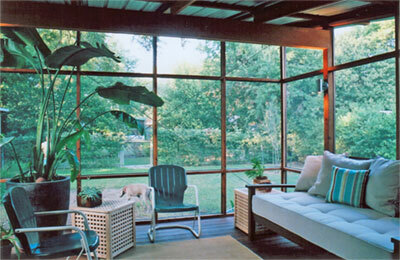 A reorganized interior and new screen porch expand this compact plan to the beautifully landscaped back yard. 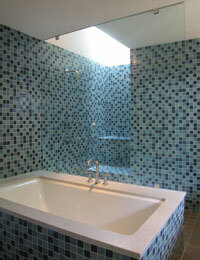 A discreet master bath and master closet addition add space to the interior. 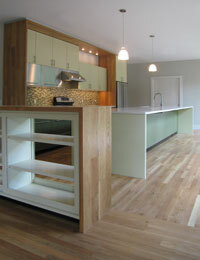 A new kitchen of beech cabinetry with steel accents and a new home office provide the necessities of the future for this family. 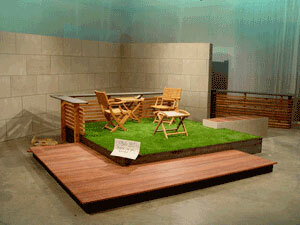 This is a 2000 sqf. 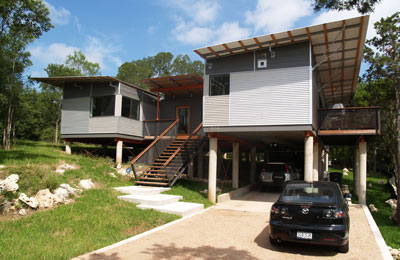 site built version of a prefabricated prototype by ModHouse LLC at 2904 Niagara Drive in Austin, Texas. 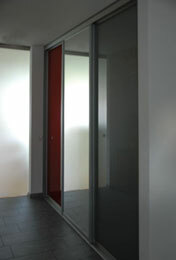 The design consists of two long bars and two short bars which are easy to transport. 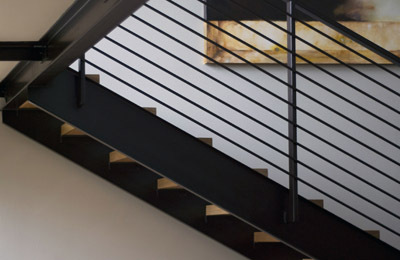 Generously spacing the long bars allows for a luxurious atrium. 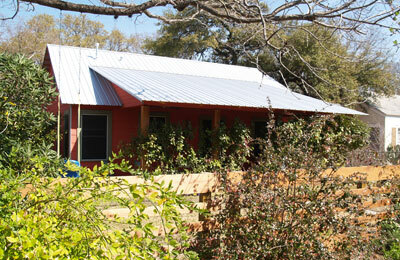 The house provides three bedrooms, two bathrooms, an office space, laundry room, as well as kitchen, dining and living space. 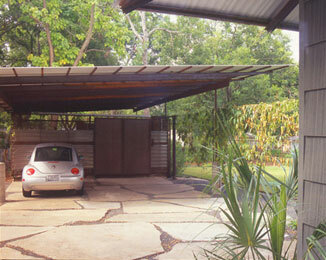 An additional carport module for 2 cars and enclosed storage space will be available in future models. 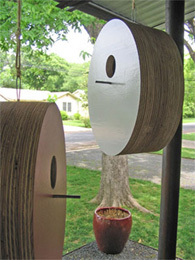 Our office developed this elegant birdhouse prototype for production. 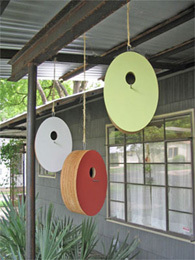 Layers of sleekly shaped marine grade douglas fir plywood add warmth, while painted colors on the front and back give them personality. 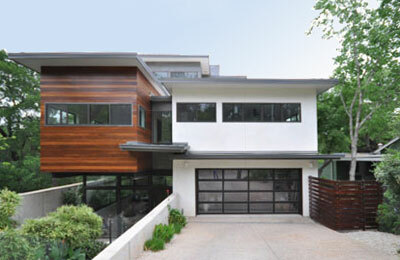 Being familiar with out work in Austin, we were asked by this young professional couple to renovate one of the very few modern homes in Greenville, SC. 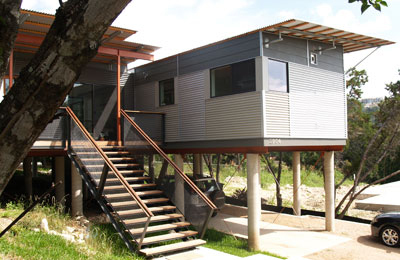 A strategy of removing walls to combine spaces, and opening exterior walls with large areas of sliding glass, visually enlarges this home and connects the interior to the heavily wooded two acre landscape beyond. 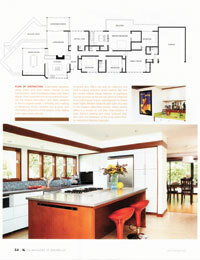 An expansion that includes a master suite and guest room, simplifies an earlier addition and returns the house to a more refined form. 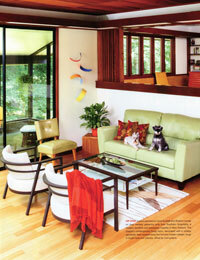 This house was featured in G-The Magazine of Greenville. 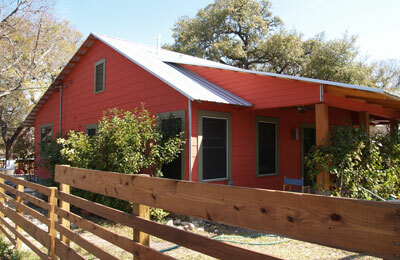 Built by Pilgrim Building Company. 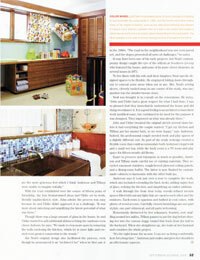 Interior design by Fern Santini. 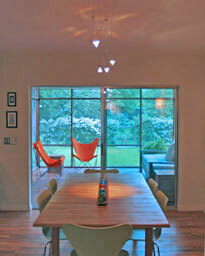 A one story addition and interior renovation in Tarrytown. 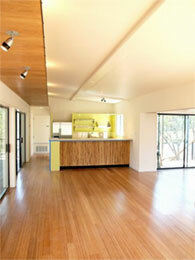 Our office completed this initial design by Paul Lamb Architects. 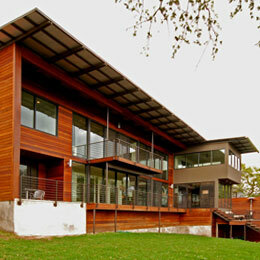 Built by Sandifer & Associates, INC. 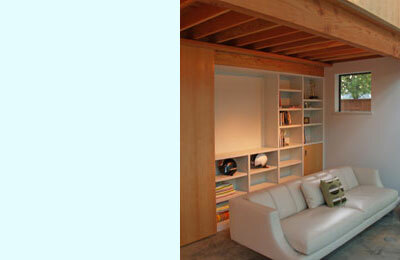 Interior design by Juniper Tedhams. 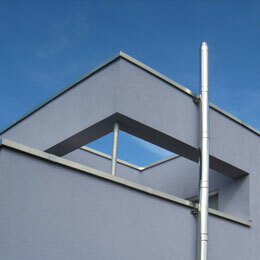 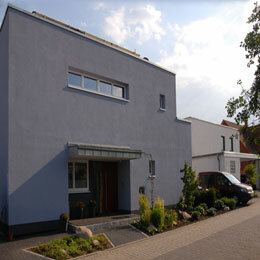 A new Zero Energy House for a VW Manager and his family in Braunschweig Germany. 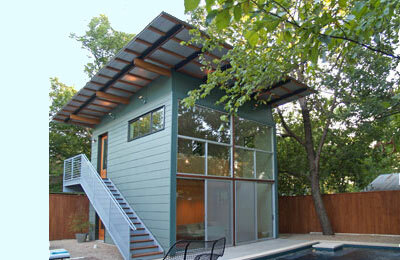 Built by Clayton Levy Little Architects. 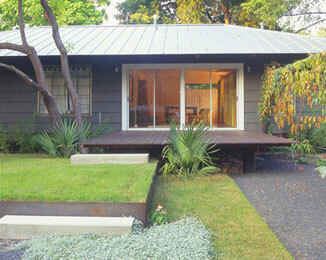 An addition of four feet on the long side of this late 70's residence in the Courtyard neighborhood transforms this house into a modern and airy home. 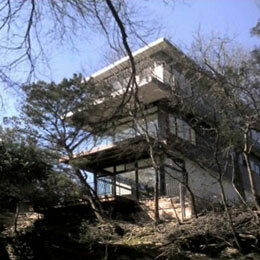 A 2-story wall of glass extends the house effortlessly toward the lake. 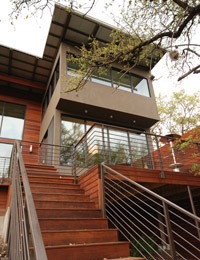 A 10 foot deep eave of steel and wood protects the glass from both southern and western sun, as well as creating a 2 story back porch with a balcony off the master bedroom. 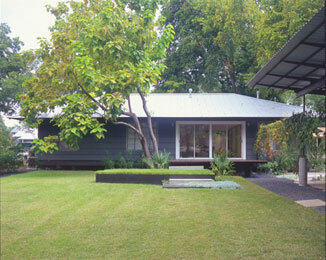 This home was chosen for the AIA Homes Tour 2008. 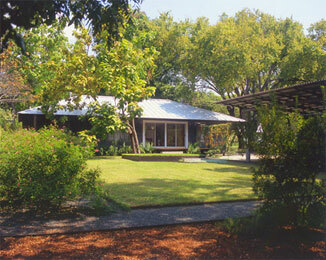 Built by Dallas Grant Construction. 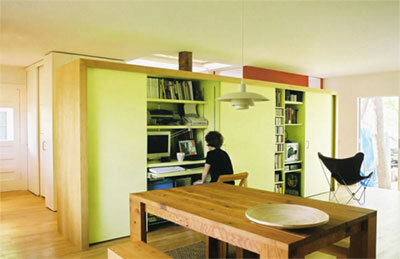 A small studio for a creative couple in the film industry. 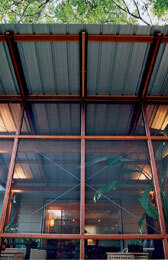 Six foot steel and douglas fir overhangs protect a wall of glass. 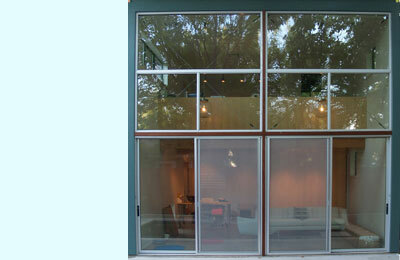 This delicately detailed transparent wall renders the loft as a two story living room to the back yard and swimming pool. 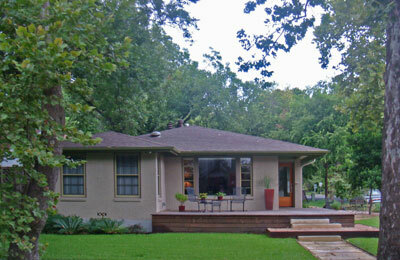 A craftsman inspired addition for a small bungalow in the Hyde Park neighborhood provides additional functional space. 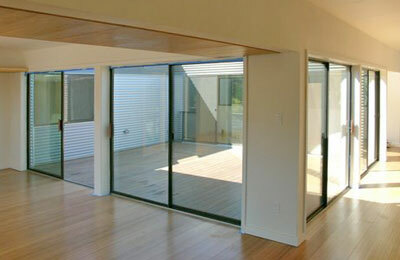 A glassy hallway serves as connection between the original house and a new master suite and laundry as well as preserving and opening access to the back yard where one of the clients, an avid gardener, spends a large amount of time. 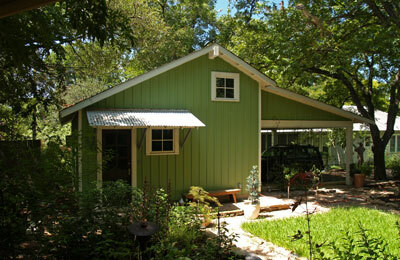 The "bunkhouse" provides multi-purpose space for arts and crafts as well as a gravel porch for entertaining when autos are not being housed there.